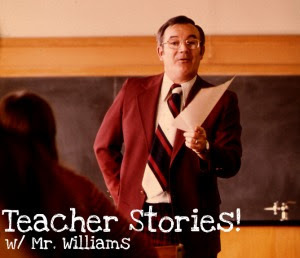 Today's teacher story is a lesson in vocabulary. We've all been in the wrong when it comes to word choice, and don't you deny it. I'm sure your parents have a story about you cutely misusing a word until it becomes a part of your family's own vernacular. We were reading a story about Mit Romney and his millions in a story about the richest presidents. Read it here from Tween Tribune, the foremost journalistic website in fluffy news that's always classroom appropriate. What can I say, if you clicked on the link and groaned at me...I'm dealing with sixth graders, yo. Give me a break. George Washington was mentioned in the article about still being the richest president with 60,000 acres and all, but Mit Romney could be in the top four if you included inflation. I mean, we all could afford 60,000 acres if we went back in time with our change and handed it over. After the article was finished, there were question marks floating above my students' heads because the word inflation was used. "Is inflation the pink stuff that goes in between the walls?" one of them asked. "No," I said, and before I could explain, another student chimed in. "No, the pink stuff is installation!" she cried out. "Stop it," I cried out, my hands in the air, "Please stop before it's too late! You're getting all these words wrong!" Okay, so I wasn't that dramatic, at least, not then. You never know with me on any given day. I had to quiet down the room to explain to them that they were getting three different words confused. "Inflation happens when prices rise, insulation is what goes in your house and an installation happens when you get a new stereo." A collective, resounding sigh of "ooohhhh" hummed through the air, and I had successfully put out another fire.